The Loire valley has some odd things going on. New Zealanders have spent some time over there, making Sauvignon Blancs that have all the fruity exuberance you might expect from Marlborough with the flinty steel of the riverbanks. 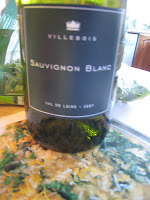 Villebois comes from the delightfully named Joost de Villebois, a Dutchman who is bringing some passion to Loire winemaking. His ethos is to maximise sun whilst minimising chemicals. It sound like a good idea. The wine is pale and smells fresh, grassy and gooseberry-like. It’s dry with a good hit of fresh citric acidity. It has a reasonable body, more so than many Sauvignons and some grapefruit and gooseberry, but there’s a lot more fruit in there with candied pineapple and other exotic fruit. It almost tastes like it took a short break in Alsace. At 13.5% it does pack quite a punch, but as it’s so easy drinking it’s easy not to notice. At £8 a bottle it’s a good alternative to a Marlborough Sauvignon with significantly fewer airmiles in Europe. Naked Wines are currently selling his wines and offering some good deals for new customers which are worth checking out. The 2008 vintage has just arrived. We are 4 students of the School of Economics and Management (UCP Lisbon) conducting our MSc. Dissertation. An important part of our work will be based on a Survey involving 400 UK consumers. In it, we ask questions about wine, in particular about Port Wine.